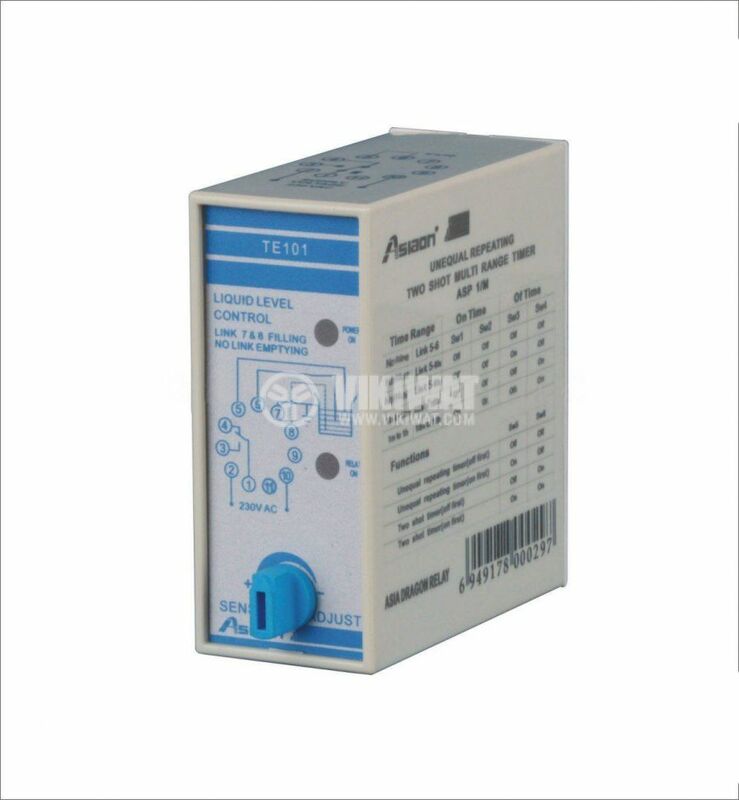 Liquid Level Controller AS-TE101, with power supply 220 VAC,NO+NC and plastic case. List Price 39.00лв. VAT Incl. 37.00лв. VAT Incl. 35.10лв. VAT Incl. 33.15лв. VAT Incl. Pin 7 is plugged into the shell of the vessel, which is metallic and at the same time ground (in a non-metallic vessel to pin 7, a metal plate is attached to the base of the vessel under the lower electrode). Pin 6 connects to the lower liquid level probe. Pin 5 connects to the upper liquid level probe. The filling of the receptacle starts and the state of the relay does not change when the electrode is connected to pin 6 (for lower level). Upon reaching the electrode connected to pin 5 (upper level), the relay also includes a signal to stop the filling of the receptacle via its contacts. Once the receptacle starts emptying and the electrode connected to pin 5 (for the upper level) is left unattached with the liquid, the state of the relay does not change. The fluid continues to decrease, and since the electrode coupled to pin 6 (for the lower level) remains free of fluid contact, the state of the relay changes, and through its contacts it feeds to start the filling of the vessel and the process is repeated. If we want to reverse the relay, we include a third electrode (or metal plate) that we immerse under the electrode connected to pin 6 (for the lower level) and the relay action is turned on. Pin 7 - connection to a metal housing (grounding).